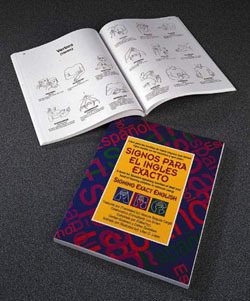 Product ID #: 103 - Ship Wt: 1 LBS..
1996, 160 pages, 8.5" x 11"
A book for Spanish-speaking Families of children in schools using Signing Exact English. Over 1,200 illustrated signs which have the words for the signs in Spanish and English. The descriptions of how to make the signs are in Spanish. Indexes of Spanish-to-English and English-to-Spanish vocabulary make for easy use.